"Story of a Soul" - By Saint Thérèse of Lisieux, the "Little Flower of Jesus"
The Story of a Soul, the autobiography of Saint Thérèse of Lisieux, is a spiritual classic and is one of the most beautiful autobiographies ever written. Sister Thérèse wrote this autobiography out of obedience to Mother Agnes of Jesus (her religious superior who was also her sister, Pauline). Her autobiography reveals her deep love of God and draws the reader into the beautiful workings of grace within her soul. This free version of the Story of a Soul is in the public domain and may be used and copied without restriction thanks to the Gutenberg Project. Additionally, you may want to read Lessons from Saint Thérèse: The Wisdom of God’s Little Flower as a companion to this spiritual masterpiece from Saint Thérèse. This electronic edition of the autobiography of St. Thérèse of Lisieux (The Story of a Soul) includes much, but not all, of the content of Soeur Thérèse of Lisieux (London: Burns, Oates & Washbourne, 1912; 8th ed., 1922), edited by Rev. T.N. Taylor. All the translated writings and sayings of St. Thérèse contained in that book are in this electronic edition, including the autobiography as well as “Counsels and Reminiscences,” letters, and selected poems. Also included are the preface by Cardinal Bourne, the prologue relating Thérèse’s parentage and birth, and the epilogue describing her final illness, her death, and related events. Not included are the illustrations, the list of illustrations, accounts of favors attributed to the intercession of St. Thérèse, documents related to her beatification, and some other material not written by her. The original page headers, page numbering, disclaimer of any intention to anticipate the judgment of the Church in calling St. Thérèse a “saint” before her canonization, and other extraneous matter, which were deemed suitable for a printed book in 1922 but not for an e-book in 2005, are not here. The French “oe” ligature, in words such as “soeur,” is not available in the standard ISO-8859-1 character set, and obviously is represented here by the two-letter combination “oe.” Italics are represented by underscores at the beginning and end, like this. The first word of each chapter is not set in all caps as it was in the printed book. A few obvious typographical errors have been corrected, with the changes in brackets, e.g., “[s]he” for “the” in Chapter IX. All else, including capitalization, punctuation, grammar, and British spelling, is intended to reflect the content of the eighth edition of Soeur Thérèse of Lisieux. If it does not, the fault is that of the transcriber (me, David McClamrock). In the first place, we know that it was by obedience that the record of God’s dealings with her soul were set down in writing. And again, the long tale of graces granted in such strange profusion through her intercession is proof sufficient that it was not without Divine permission and guidance that the history of her special and peculiar vocation has become the property of all Catholics in every land. It is for God to keep, and for Him to make known the secrets of His Love for men. And in the case of Soeur Thérèse it has been His Will to divulge His secrets in most generous consideration for our needs. It is the old story of simplicity in God’s service, of the perfect accomplishment of small recurring duties, of trustful confidence in Him who made and has redeemed and sanctified us. Humility, self-effacement, obedience, hiddenness, unfaltering charity, with all the self-control and constant effort that they imply, are written on every page of the history of this little Saint. And, as we turn its pages, the lesson is borne in upon our souls that there is no surer nor safer way of pleasing Our Father Who is in Heaven than by remaining ever as little children in His sight. Doubtless for many of her clients whose hearts are kindled as they read this book, Soeur Thérèse will obtain, as she has done so often in the past, wonderful gifts for health of soul and body. But may she win for all of us without exception a deep and fruitful conviction of the unchanging truth, that unless we become as little children in the doing of our Heavenly Father’s Will, we cannot enter into our Eternal Home. In the month of September, 1843, a young man of twenty climbed the mountain of the Great St. Bernard. His eyes shone with a holy enthusiasm as the splendour of the Alps stirred to the depths his responsive nature. Presently, accustomed as they were to discern God’s beauty in the beauty of His handiwork, they glistened with tears. He paused for a space, then, continuing his journey, soon reached the celebrated monastery that like a beacon on those heights darts afar its beams of faith and magnificent charity. The Prior, struck by the frank and open countenance of his guest, welcomed him with more than wonted hospitality. Louis Joseph Stanislaus Martin was the pilgrim’s name. He was born on August 22, 1823, at Bordeaux, while his father, a brave and devout soldier, was captain in the garrison there. “God has predestined this little one for Himself,” said the saintly Bishop of Bordeaux on the occasion of his baptism, and events have proved the truth of his words. From this town, by the banks of the Garonne, his parents went to Alençon in lower Normandy, and there in their new home, as in their old one, Louis was the cherished Benjamin. Louis was disappointed. He set out for home—for exile he would have said—but ere long he saw clearly that his life was to be dedicated to God in another and equally fruitful way, and that the Alpine monastery was to be nothing more to him than a sweet memory. God gave ear to her prayer, and His Finger was visible in the circumstances which led to her becoming the wife of Louis Martin, on July 12, 1858, in Alençon’s lovely Church of Notre Dame. Like the chaste Tobias, they were joined together in matrimony—”solely for the love of children, in whom God’s Name might be blessed for ever and ever.” Nine white flowers bloomed in this sacred garden. Of the nine, four were transplanted to Paradise ere their buds had quite unfolded, while five were gathered in God’s walled gardens upon earth, one entering the Visitation Convent at Caen, the others the Carmel of Lisieux. The grandeur of the Priesthood, glorious upon earth, ineffable in eternity, was so well understood by those Christian parents, that their hearts coveted it most dearly. At all costs the family must have a Priest of the Lord, one who would be an apostle, peradventure a martyr. But, “the thoughts of the Lord are not our thoughts, His ways are not our ways.” Another little Joseph was born, and with him hope once again grew strong. Alas! Nine months had scarcely passed when he, too, fled from this world and joined his angel brother. They little dreamed of this future apostolate, nevertheless they made ready their souls day by day to be God’s own instruments in God’s good time. With most loving resignation they greeted the many crosses which the Lord laid upon them—the Lord whose tender name of Father is truest in the dark hour of trial. Every morning saw them at Mass; together they knelt at the Holy Table. They strictly observed the fasts and abstinences of the Church, kept Sunday as a day of complete rest from work in spite of the remonstrance of friends, and found in pious reading their most delightful recreation. They prayed in common—after the touching example of Captain Martin, whose devout way of repeating the Our Father brought tears to all eyes. Thus the great Christian virtues flourished in their home. Wealth did not bring luxury in its train, and a strict simplicity was invariably observed. In that house the “Little Flower of Jesus” first saw the sunshine. Again and again, in the pages of her Autobiography, she calls herself by this modest name of the Little Flower, emblematic of her humility, her purity, her simplicity, and it may be added, of the poetry of her soul. The reader will learn in the Epilogue how it was also used by one of her favourite martyr-saints—the now Blessed Théophane Vénard. On the manuscript of her Autobiography she set the title: “The Story of the Springtime of a little white Flower,” and in truth such it was, for long ere the rigours of life’s winter came round, the Flower was blossoming in Paradise. 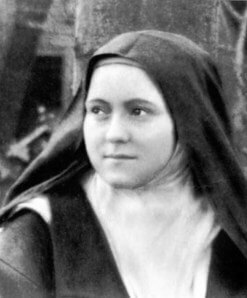 The gentle St. Francis waived his claim in favour of the great Reformer of the Carmelite Order: the child recovered, and so retained her sweet name of Thérèse. Sorrow, however, was mixed with the Mother’s joy, when it became necessary to send the babe to a foster-mother in the country. There the “little rose-bud” grew in beauty, and after some months had gained strength sufficient to allow of her being brought back to Alençon. Her memory of this short but happy time spent with her sainted Mother in the Rue St. Blaise was extraordinarily vivid. To-day a tablet on the balcony of No. 42 informs the passers-by that here was born a certain Carmelite, by name, Sister Teresa of the Child Jesus and the Holy Face. Fifteen years have gone since the meeting in Heaven of Madame Martin and her Carmelite child, and if the pilgrimage to where the Little Flower first saw the light of day, be not so large as that to the grave where her remains await their glorious resurrection, it may nevertheless be numbered in thousands. And to the English-speaking pilgrim there is an added pleasure in the fact that her most notable convert, the first minister of the United Free Church of Scotland to enter the True Fold, performs, with his convert wife, the courteous duties of host. It will not be amiss to say a brief word here on the brother and sister of Madame Martin. Her sister—in religion, Sister Marie Dosithea—led a life so holy at Le Mans that she was cited by Dom Guéranger, perhaps the most distinguished Benedictine of the nineteenth century, as the model of a perfect nun. By her own confession, she had never been guilty from earliest childhood of the smallest deliberate fault. She died on February 24, 1877. It was in the convent made fragrant by such holiness that her niece Pauline Martin, elder sister and “little mother” of Thérèse, and for five years her Prioress at the Carmel, received her education. And if the Little Flower may have imbibed the liturgical spirit from her teachers, the daughters of St. Benedict in Lisieux, so that she could say before her death: “I do not think it is possible for anyone to have desired more than I to assist properly at choir and to recite perfectly the Divine Office”—may it not be to the influences from Le Mans that may be traced something of the honey-sweet spirit of St. Francis de Sales which pervades the pages of the Autobiography? With the brother of Zélie Guérin the reader will make acquaintance in the narrative of Thérèse. He was a chemist in Lisieux, and it was there his daughter Jeanne Guérin married Dr. La Néele and his younger child Marie entered the Carmel. Our foreign missionaries had a warm friend in the uncle of Thérèse—for his charities he was made godfather to an African King; and to the Catholic Press—that home missionary—he was ever most devoted. Founder, at Lisieux, of the Nocturnal Adoration of the Blessed Sacrament, and a zealous member of the Society of St. Vincent de Paul, he was called to his abundant reward on September 28, 1909. Verily the lamp of faith is not extinct in the land of the Norman. This is not true of the sainted authoress of the chapters that follow—”less radiant,” in the medium of a translation. In her own inimitable pages, as in those of a Campion or an Ignatius, a Teresa of Avila, or a John of the Cross—the Spirit of Poetry is the handmaiden of Holiness. This new lover of flowers and student of the stars, this “strewer of roses,” has uplifted a million hearts from the “base earth” and “black fog” to the very throne of God, and her mission is as yet but begun. The pen of Soeur Thérèse herself must now take up the narrative. It will do so in words that do not merely tell of love but set the heart on fire, and at the same time lay bare the workings of God in a soul that “since the age of three never refused the Good God anything.” The writing of this Autobiography was an act of obedience, and the Prioress who imposed the task sought, in all simplicity, her own personal edification. But the fragrance of its pages was such that she was advised to publish them to the world. She did so in 1899 under the title of L’Histoire d’une Âme. An English version by M. H. Dziewicki appeared in 1901. “As Little Children”: the abridged life of Soeur Thérèse. Published at the Orphans’ Press, Rochdale.